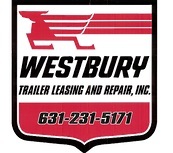 WESTBURY TRAILER LEASING & REPAIR INC. Thank you for taking a moment to learn about Westbury Trailer Leasing and Repair, Inc.
WTL has been in business since 1943 servicing the east coast, Nassau, Suffolk, Brooklyn, Bronx, Queens, and the Tri-state area. We are now entering our third generation as a family owned and operated business. WTL’s fleet of over 300 air ride trailers consist of 28’ 40' 45' 48' and 53' Dry Van trailers in both swing door and roll up door configuration. Road trailers as low as $225 per month. Available for road use or storage use, with low price delivery & pick-up services. WTL operates out of a 6-acre yard in Brentwood Long Island using state of the art office and service equipment. We use the most up to date computer software and technology. WTL Rents on-site trailer storage parking with video surveillance. WTL Provides Emergency Mobile repair service. WTL’s Repair Division provides all your service needs. Preventative maintenance - full welding shop - Brake replacement, Suspension Work - exterior body repair - interior repair - roof repair - roof replacement - bridge hits - frame repair – electrical – lighting - door replacement - full tire repair – tire replacement – FHWA inspection. Whether it’s a WTL trailer on-Lease that is in for its free annual FHWA inspection or your own trailer in for repair, our expert licensed mechanics will provide you with the lowest prices and quickest turnaround times in the industry. DON’T BE A TRAILER MECHANIC, DO WHAT YOU DO BEST AND LET US DO WHAT WE DO BEST! Copyright ? 2007 Westbury Trailer Leasing & Repair, Inc. and Lakeside Creative Services. All Rights Reserved.